A timber beam AB, 6 in wide by 10 in deep and 10 ft long, is supported by a guy wire AC in the position shown in Fig. P-516. 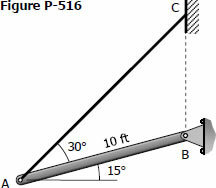 The beam carries a load, including its own weight, of 500 lb for each foot of its length. Compute the maximum flexural stress at the middle of the beam.